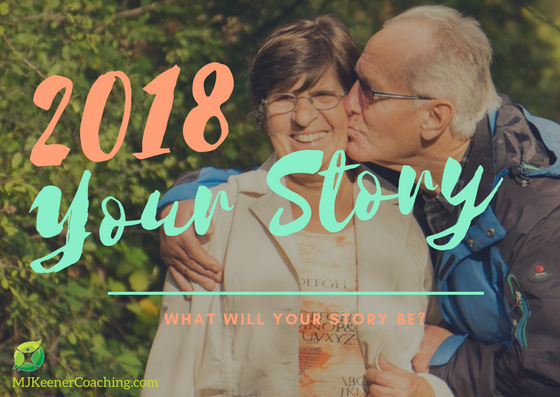 What is Your 2018 Story Going to Be? It’s that time of year again when we reflect on the year past and begin looking forward to 2018. At this point, we begin to look at making those New Year’s Resolutions; and maybe, if you’re like me, you’re looking at making ones very similar to the ones you made last year. As we move into the New Year, just like me, you may find the resolve required to change habits and bring those resolutions to life begin to dissolve. So how do we go about breaking that cycle and take charge of creating our new story? The first step is to decide what you want your new story to be. Let’s say you have lived into the story you want for 2018. What does this story look like? How is the new story different from your current experience? Now that you have identified the gap between the story you are living and the one you want to create, you will want to consider these questions. What are the values you hold dear? Does your new story allow you to live into those values? If not, then question the parts of your story which are not in alignment with your values. Remember this is your story; you are in charge; and it is dynamic. Now comes the most difficult part. The question of “why” comes into focus. Often people will decide that taking charge of their health and fitness is part of their new story. So using fitness as an example, the questions I have for you and for myself are, “why is this behavior change important for you?” You might say, “Well, the doctor told me to,” or, “My kids want me to.” These are the easy answers to why. However, I don’t know about you; but my experience is that just because others want me to do something has never given me quite enough to push me over the edge of inertia. At the end of the day, your why and my why has to be all about what is in it for me to take the action to make the change. Staying with our fitness example, when we go to the gym for the first time we get a little sore, we overdo, or we don’t do the research to find the right program for our current fitness level. What will overcome all these obstacles? What is it underneath that really is a passion for you? What is that WHY that you can pull up and look at when all of the objections such as “I don’t want to go this morning… I’m too sore… It’s too early… It’ raining…” keep us from keeping on track? What is that WHY that when you look at it will cause you to get up and go despite all your excuses? I want to be mobile as long as I can. I want to be active for as long as I can be. I want to take the least amount of medications that I possibly can. I want to minimize the effects of my metabolic syndrome, arthritic knees, and high blood pressure on my quality of life. I want to create a business that makes my heart sing and I can sustain me as I retire. For 2018, I am creating a story of living a vibrant, active, healthy life filled with joy and meaning. I am launching my Coaching, spending more time with friends and family, and volunteering. Creating a Facebook group, launching a website, and writing this blog are steps I am taking (totally outside my comfort zone, by the way) as I begin creating a new story? What do you want your story to be and what is the WHY behind it? Are you ready to take charge of your story?